ONCE upon a time in Japan, there lived in the country an old man and his wife. They were very lonely because they had no children. One day the old man went into the mountains to cut firewood and his wife went to the river to wash clothes. No sooner had the old woman begun her washing than she was very surprised to see a big peach floating down the river. It was a huge peach. The biggest she had ever seen. She pulled the peach out of the river and took it home to give her husband for supper. Late in the afternoon the old man came home, and the old woman said to him: "Look what a wonderful peach I found for your supper." The old man said it was truly a beautiful peach. He was so hungry that he said: "Let's divide it and eat it." So the old woman brought a big knife from the kitchen and was getting ready to cut the peach in half. But just then there was the sound of a human voice from inside the peach. "Wait! Don't cut me!" said the voice. Suddenly the peach split open, and a beautiful baby boy jumped out. The old man and his wife were very happy, and they took the baby to be their son. Since he was born from a peach, they named him Momotaro, which means Peach Boy. They loved Momotaro very much and raised him well. When Momotaro was about fifteen years old, he went to his father and said: "Father, you have always been very kind to me. Now I am a big boy and I must do something to help my country. In a distant part of the sea there is an island named Ogre Island. Many wicked ogres live there, and they often come to our land and do bad things like carrying people away and stealing their things. So I'm going to go to Ogre Island and fight them and bring back treasure. Please let me do this." The old man was surprised to hear this, but he was also very proud of Momotaro for wanting to help other people. So he and the old woman helped Momotaro get ready for his journey to Ogre Island. The old man gave him a sword and armor, and the old woman fixed him dumplings for lunch. Then Momotaro began his journey. He walked toward the sea. As he went, he met a spotted dog. The dog growled at Momotaro and was about to bite him, but then Momotaro gave him one of the dumplings. He told the spotted dog that he was going to fight the ogres on Ogre Island. So the dog said he'd come along too. Momotaro and the spotted dog kept on walking and soon they met a monkey. The spotted dog and the monkey started to fight. But Momotaro explained to the monkey that he and the spotted dog were going to fight the ogres on Ogre Island. Then the monkey asked if he could go with them. So Momotaro gave the monkey a dumpling and brought him along. Momotaro and the spotted dog and the monkey kept on walking. Suddenly they met a pheasant. The spotted dog and the monkey and the pheasant were about to start fighting. But when the pheasant heard that Momotaro was going to fight the ogres on Ogre Island, he asked if he could go too. So Momotaro gave the pheasant a dumpling and brought him along. So, with Momotaro as their general, the spotted dog and the monkey and the pheasant, who usually hated each other, all became friends and followed Momotaro. They walked a long, long way, and finally reached the sea. At the edge of the sea Momotaro built a boat. They and all got in the boat and started across the sea toward Ogre Island. When they came within sight of the island, they could see that the ogres had a very strong fort there. And there were many ogres. There were many different colors of ogre, red, blue and green. First the pheasant flew over the walls of the fort and began to peck at the ogres' heads. They all tried to hit the pheasant with their clubs, but he was quick and dodged all their blows. And while the ogres weren't looking, the monkey slipped up and opened the gate of the fort. Then Momotaro and the spotted dog rushed into the fort and started fighting the ogres too. It was a huge battle! The pheasant pecked at the heads and eyes of the wicked ogres. And the monkey clawed them. And the spotted dog bit them. And Momotaro cut them with his sword. At last the ogres were defeated. They all bowed down low before Momotaro and promised never to be wicked again. Then they brought Momotaro all the treasure they had. It was a great treasure, with gold, and silver, and colored jewels. There was an invisible coat and hat, arid a hammer that made a piece of gold every time you hit the ground, and many other wonderful things. Momotaro and his three friends carried all this in their boat back to their own land. Then they made a cart and put all the treasure in the cart and pulled it all the way to Momotaro's house. How surprised the old man and his wife were when they saw their son come home safely! 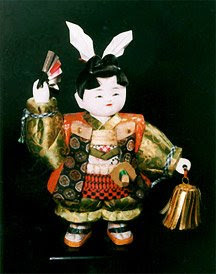 With all the treasure Momotaro brought they were very rich, and they all lived happily ever after.